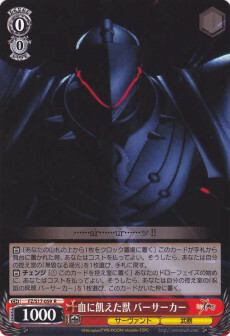 【A】［Place the top card of your deck into Clock］ When this card place to stage from hand, you may pay the cost. If you did, choose 1 「無毀なる湖光」 from your waiting room, place it into hand. 【A】 CHANGE ［① Place this card into Waiting Room］At the start of your Draw Phase, you may pay the cost. If you do, choose 1 「呪詛の具現 バーサーカー」from your Waiting Room, place it into this card's previous slot. …… ar (ア)…… ur (ア)……ッ! !